Hydrolyzed Whey Protein, Natural Flavor, Stevia Leaf Extract, Potassium Citrate, Salt. Mix one (1) scoop (50g) with 10 fl. oz. of water immediately following your workout or any time you need high quality nutritional supplementation. If you are pregnant, nursing, taking any medications or have any medical condition, consult your doctor before use. Discontinue use and consult your doctor if any adverse reactions occur. Not intended for use by persons under the age of 18. KEEP OUT OF REACH OF CHILDREN. STORE AT ROOM TEMPERATURE AND AVOID EXCESSIVE HEAT. TAMPER RESISTANT: DO NOT USE IF SEAL UNDER CAP IS BROKEN OR MISSING. Contents are sold by weight. Some settling may occur. This blend of high quality fast and slow digesting proteins was specifically formulated for those athletes serious about their training and looking to take their workouts and performance to the next level. 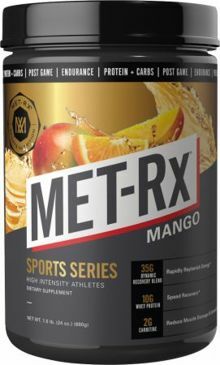 * When consumed postgame/post-workout, this combination will deliver amino acids to immediately kick-start recovery and will provide a steady stream well after your game/workout is done. * Use in conjunction with an intense daily exercise program and a balanced diet including an adequate caloric intake.